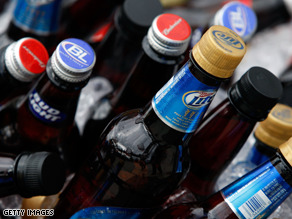 What beer should be served at the Obama-Gates-Crowley get together? (CNN) - The upcoming White House meeting with Henry Louis Gates, Jr., and the Cambridge police officer who arrested him earlier this month appears to have touched off a fresh debate all on its own: what kind of beer should be served? Earlier this week the White House indicated each man would drink the beer of their choice - Bud Light for President Obama, Blue Moon for the police officer, and perhaps Red Stripe or Beck's for Gates. But one Massachusetts congressman thinks another beer entirely should be served: Boston's own Sam Adams. Instead, the White House should serve the three men - all with ties to Massachusetts - the local favorite, not only because of its popularity in the region but also because it remains the largest American-owned and brewed beer, Neal says. But Sam Adams founder and brewer Jim Koch told NPR if it was up to him he would make a special beer just for the event. "I'd make a blend of ingredients from all over the world. Which is certainly what's represented there with the three participants," he said. "I would blend those ingredients together artfully and harmoniously, because that's really what we all hope for." Meanwhile, the Boston Globe reports other Massachusetts-based beer companies are also hoping to get their product a space at the high-profile meeting. Dan Kenary, president of Harpoon Brewery, told the paper they are working every "back-door channel" the company has. "We'd love to be the beer at this event," Kenary said. Read Rep. Neal's letter (PDF) here.